Could Jordan Tripp be a draft-day surprise? As teams continue to tailor their respective draft boards, one player might be undervalued because of the perceived competition he played against. 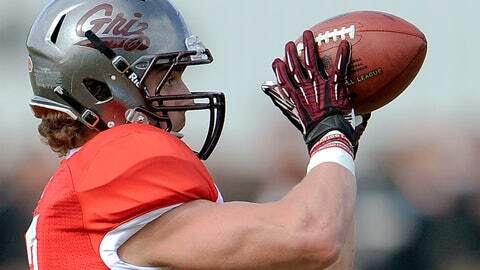 After posting a team-high in tackles at the Senior Bowl coupled with an impressive performance at the NFL Combine, Montana linebacker Jordan Tripp could be one of this year’s notorious draft-day surprises. Tripp, who matched up against FCS teams during his collegiate career, had no trouble playing against the nation’s elite in January. During his time in Indy, Tripp scored well with scouts and performed the fastest 20-yard shuttle run (3.96) as a linebacker since A.J. Hawk in 2006. He also was in the top 10 at his position in the 40-yard dash, three-cone drill, vertical and broad jumps. Tripp’s change of direction, lateral quickness and closing speed will make the leap into the NFL an easier transition than for others. Naturally people will continue to have their doubts since Tripp didn’t play at a premier university. That’s something the 22-year-old linebacker uses as motivation. “I think it’s funny that people want to do that,” Tripp said with a laugh. “The reason I’m not a first-round pick is because I didn’t play at Alabama or Texas. While Tripp trains for his May 18 pro day at California Strength in San Ramon, Calif., he has continued to master his craft by working on his strength and flexibility. By doing Olympic-style weight training and yoga three times a week, he has fine-tuned himself into a prospect that will not only allow him to test well, but perform at a high level on game days. Tripp, a third generation player at Montana, arrived on campus in 2009 as a 6-foot, 180-pound safety/linebacker hybrid. Since then Tripp went through a rapid growth spurt, which included him gaining three inches in height and packing nearly 60 pounds onto his frame. While the 6-foot-3, 240-pounder plans to let his Combine numbers stand at the pro day, he’ll partake in position-specific drills to show off his raw athleticism.